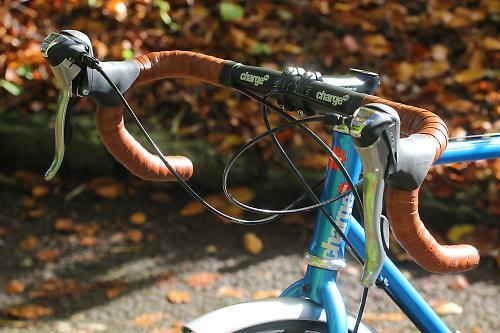 In a similar vein to the Genesis Croix de Fer recently tested, Charge's Filter Hi is a do it all commuter, light tourer and part time crosser. Drop bars, discs, huge tyre clearances, mounts for mudguards and rack all tip a nod to the mile muncher who's happy to keep the pedals spinning whatever the weather. While it never really went away steel is back en vogue and Charge is certainly running with it. Every one of their road models is made from it with the Filter Hi specifically using Tange Infinity tubing, a seamless, double butted cromo. Steel is always renowned for the way it rides and the Filter Hi's Tange frame is no different. It's a supple feeling, almost elastic while still feeling stiff enough for purpose meaning you can spend hours in the saddle without taking a battering. As mentioned above there is a full complement of mounts for guards and rack while the mount for the rear disc calliper is on the seatstay to provide clearance if you do fancy a bit of load carrying. The fork is a Tange steel cyclocross version even though with its thin straight legs it's hard to believe it'll resist all the forces under hard braking from the disc. The geometry is pretty relaxed at 71.5° for the headtube and 73° for the seat (54cm/medium) and this leads to a very stable predictable ride. Even on descents the Charge turns in with little fuss and holds a line very well regardless of speed, I had it up nudging 45mph at one point and apart from a bit of under steer from the tyre everything was pretty drama free. The Charge comes in just a penny shy of the usual thousand pound bike to work scheme limit and for your cash you get a decent amount of kit. Tiagra groupset with an FSA Omega chainset, Pro-Max DSK-715 cable operated discs, Alex XD Lite rims and Kenda Kwick Tracx 28mm tyres. The finishing kit is all Charge logoed stuff, alloy oversized bars and stem, alloy seatpost and their highly regarded Spoon saddle. There are only 4 sizes in the range XS-L with top tube lengths of 51-56cm. The majority of the test miles were done commuting in all sorts of conditions. Flood water up to the bottom bracket, high winds, snow, no matter what, we've got through – with varying levels of success I might add. The gear cables are run along the top of the top tube, ideal if you fancy a go at a bit of cyclocross as it makes the bike easier to shoulder but it also keeps everything out of the road spray and mud. 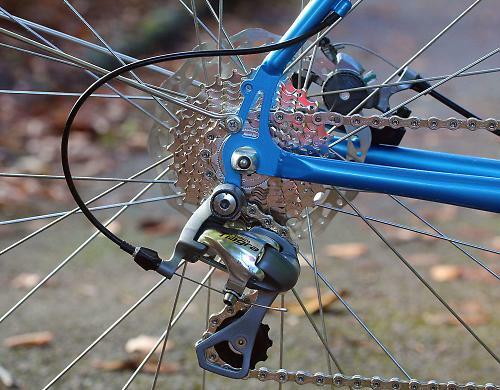 One component that has stood out through all of this is the disc brakes. Whatever your view on a drop bar/disc combo the amount of modulation and performance in crappy weather makes them the perfect choice for this style of bike. Being able to control your speed downhill in two inches of snow unlike the cars in front of me, even when you're on slick tyres was the highlight of my January. The Pro-Max callipers use the same pads as SRAM's BB5 so a ready stock of replacements should be easy to find whether at your LBS or online. The rotors are 160mm front and rear and as I've mentioned modulation is very good as is the overall performance wet or dry, you can pull up very quickly with very little chance of a lock up. 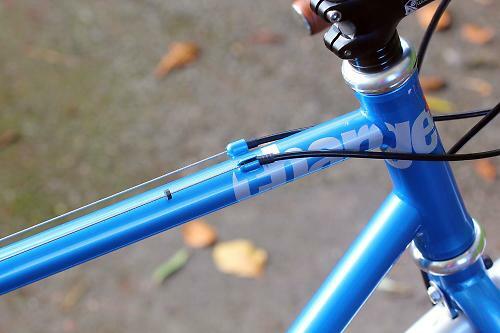 The rear cable runs below the down tube but is fully enclosed from the lever to calliper while the front runs down the fork leg. Small braze ons the length of the cables keep things tidy. This sets the theme with regards to the rest of the kit, it's all functional with a proven background and is there to be reliable rather than flash. The Alex XD wheels took an absolute pounding crashing through invisible water filled potholes in the dark with a bit of rough canal path chucked in for good measure and not a single complaint. This is all with the Kenda tyres pumped up to their max 85psi pressure. Kenda's Kwik Tracx tyres seem to offer very little in the way of rolling resistance and corner way better than I thought they would. They're still in great nick as well even after 1000 miles of back lanes and canal path showing no signs of cuts or a single puncture. The reflective sidewall is a nice touch for night riding as well. 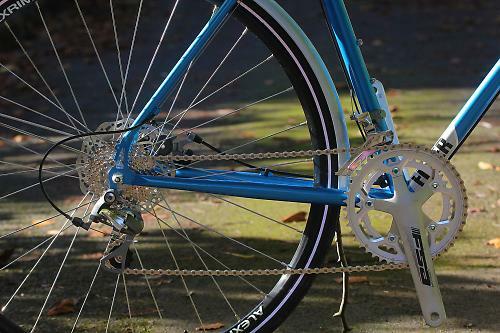 Shimano's 10 speed Tiagra provides a decent level of shifting for the cost. As I've mentioned on other bike reviews the shifting can be a little vague and the gear indicator is pretty pointless but it doesn't mind getting covered in road crap and continues to work pretty well when it does. Experience shows it lasts well too especially as a winter groupset. An Omega compact deals with shifting at the front and as with all of FSA's cranksets it's a decent performer and matches the Charge with its silver finish. Rather than the usual 50-34 combination this uses a 46-36 paired with an 11-28 cassette at the rear, the gearing may sound low but I didn't once wish I had a 50 on the front. Due to the 25.8lb/11.7kg weight of the bike, speed is scrubbed off as soon as you hit the slightest incline, and having the 46 on the front means you can just flick up and down the cassette for small increments rather than the huge 16 tooth jump provided by a 50/34. You will run out of gearing at about 30mph but it's a sacrifice I'm happy to make especially if you're load carrying. Finishing things off are the Charge components of which the handlebars, stem and seatpost are a weight reducing exercise replacing the 2012 model's FSA items. The anatomic bars are very comfortable providing plenty of hand positions and I found myself using the drops quite a bit. 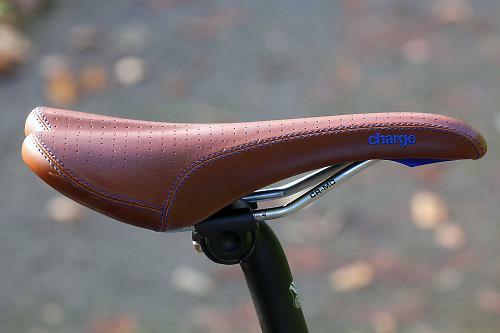 The Spoon saddle is a favourite of mine, I run one on my own commuting bike and even though it's covered around 7000 miles so far it's still looking good. The brown version found here on the Filter ties in nicely with the leather look bar tape. It's not the most padded or comfortable but should wear well. The mudguards are custom for the Filter and although not entirely full length like SKS' Chromoplastics they do keep a surprising amount of road spray off of your feet. Once fitted and adjusted they remain in place and are largely rattle free, tolerances are tight width wise with the 28mm tyres but there is plenty of clearance above which should mean things shouldn't get trapped between guard and tyre. 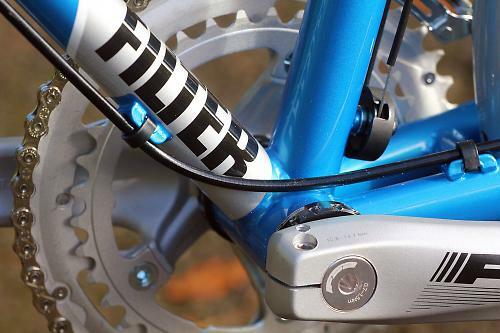 Overall the Filter Hi is a nice ride, the frame is comfortable and certainly stiff enough for what it's designed for. 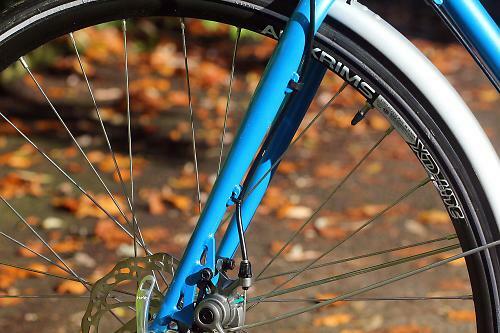 As a commuter it ticks all the right boxes with regards to guards and rack fittings plus the ability to change to larger knobbly tyres to take on snow or towpaths making it a real four season bike. It is heavy though and while it rolls well on the flat even slight changes in terrain will see you scrabbling around through the gears trying to keep the pace up plus if you have a stop start commute the constant acceleration from a stand still takes its toll. It handles well though with predictable steering and an overall relaxed feel to it, so as long as you're not in a hurry to get to your destination it'll be an enjoyable trip. Well built, well specced four season commuter and light tourer but on the heavy side. Charge say "The steel framed Filter has a more relaxed cross geometry, making it the perfect commuting machine. Seamless butted Tange Infinty tubing keeps the frame light and responsive, perfect for smoothing out the potholes and canal towpaths on your daily grind." Well I tried all that and it did what it says on the tin, not sure about the 'light' frame though. Fit was good, the medium we tested has a 54cm top tube which is pretty much the norm. Yes, that steel feel is there. Yeah, there were no issues. Its not a performance machine so stiffness isn't such a major concern. Yes, not really a problem though. handling is suprisingly good from a performance point of you. Very reassuring and predictable. The Spoon saddle is comfortable while still offering a firm perch. The bars and stem keep things tight. The fork is stiff and resists braking forces very well. Tyres = good, weight = bad. It does accelerate okay but it hurts. Not what its about but good for its weight. Tiagra is very workmanlike, no frills but it does its job. Hardwearing too. The wheels are bombproof and roll well and the tyres are much the same. Dependable if you've got a long trip planned. It all works well as Charge stuff always does. Would you consider buying the bike? Yes if it fitted my needs. do Charge expect anyone to put a rack on this and ride up a hill? The 34 on a compact is to help climbing hills unloaded on a light bike, so fitting a 36 on a heavier bike with rack mounts defies reason. I'd love to hear their logic. My tourer has a MTB triple, 42,32,22 and when I've got 2 panniers on that 22 gets used. The hills don't go away just because you're not riding a sportive or segment bagging on Strava. Agree, 46/32 might be more realistic, but if it were mine I'd bang a triple on it for sure. I've got a parts bin that would cope with that, but it suddenly becomes less good value. I suspect most people will actually buy it as a commuter and for pottering about on the weekend, for which it seems to be a brilliant fit. It's not really 'serious' enough in one or another category to appeal to those with lots of bikes, but for a BTW thing it will make a lot of sense to a lot of people - Home brand, steel, discs, racks... all good. I love how the review puts a positive spin on a negative design choice. The front mudguard is way too short ... next to useless IMHO. I find even SKS mudguards a bit short and have added longer mudflaps to mine to keep my feet dry and keep mud off the chainset. Sounds like they fitted cheap, poorly designed, 'custom' unbranded mudguards to save money. This is a false economy as these would be the first thing I'd replace if I bought this bike. Its a very nice bike too. Bit of a contradiction there, though I presume you were comparing with mudguards removed for the knobblies. 11.7kg is also pretty reasonable for a bike this well equiped, though I would prefer to have BB7s to the BB5's fitted ... the pads last much longer (and cost the same) and they have in-board pad adjustment. A few upgrades and this bike would tick all the right boxes for me. Love the colour. @nbrus to be fair I think the distinction (though not explicitly made above) would be to run the knobs in 'CX mode' - without the guards - thus buying your self another 10mm or so for something more like 35/37c. They're not BB5s, they just take BB5 pads. Also, the SKS guards have a double stay arrangement which make fitting then around discs problematic (on my bike, anyway). I wonder if the shortness of the guards has anything to do with the stay arrangement? the gearing does seem an odd choice, hints more at cx than load carrying. A triple would seem more logical but they're a bit of fashion at the moment. I wonder if the new 'mountain compact double' (basically a 104 BCD crank without the outer ring) will start appearing on this kind of bike where you can have a 38/24 or 36/22 combo. As long as you don't mind coasting down the faster hills, a 38-11 will see you comfortably into the late 20mphs and the bottom end would be handy. ...the SKS guards have a double stay arrangement which make fitting then around discs problematic (on my bike, anyway). I wonder if the shortness of the guards has anything to do with the stay arrangement? I had to bend the stays on my SKS mudguards to get them to fit various bikes I own. It wouldn't be hard to have these 'custom' bent at the factory. I think that 46/36 is a better combo than 50/34 for most people. You could swap the cassette with 12-30 for a lower bottom gear. 11-32 would be even better but this may require a MTB rear mech. At the other end 46x12 = 50x13. 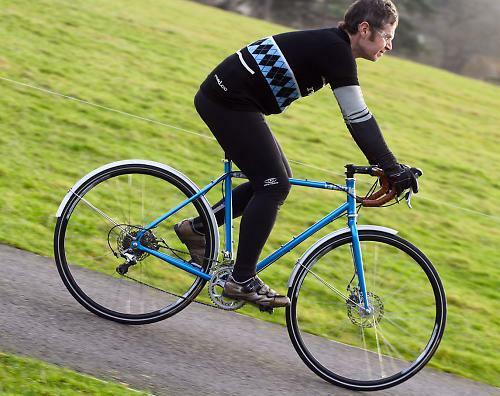 I really like the look of skinny steel frames and this is the sort of spec - and colour - I'd wish for in a year-round commuter/trainer (bar the inadequate front mudguard, that would be replaced with Tortec full length). I don't think 11.7 kg is particularly heavy for a steel frame with steel fork, discs and mudguards. 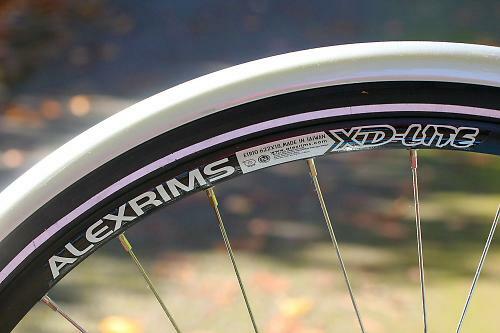 XD Lite are 32-hole offroad rims, it looks like a resilient wheelset, not a flyweight minimally-spoked pair you save for dry summer days. If you put two 750ml water bottles on a bike you've just added over 1.5 kg yet I don't see people suddenly unable to climb hills because of this additional weight. It does seem bizarre to criticise a bike for not being something it wasn't designed to be. Given the price point, this appears to have cycle to work schemes in mind for which it seems to be nearly perfect barring a few matters of personal taste. I don't suppose most people need or want triple chainsets. This is no Long Haul Trucker. Hate that 'Designed in GB' label. It only highlights the fact that this country is incapable of even welding a few tubes together.